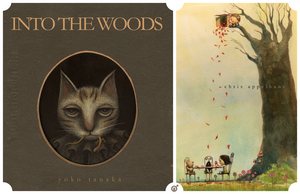 Gallery Nucleus presents Into the Woods, a never before seen collection of new original work by five masterful storytellers and artists. This is an all-ages show suitable for children. Children’s stories are often much more than little tales of morality with neatly wrapped happy endings. What lurks beneath can often be sinister, and very grown-up indeed. Into the Woods features work by established visual storytellers Catia Chien, Chris Appelhans, Kazu Kibuishi, Robert Kondo, and Yoko Tanaka. Their work appeals to a wide audience--often whimsical, at times dark, and always more than a bit magical. Several artists will be in attendance opening night to sign books, cards, and prints. 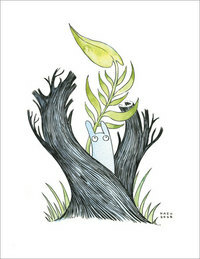 An award-winning illustrator, Catia Chien’s work has been seen in children’s books, the Flight graphic novel anthology, and various exhibitions. 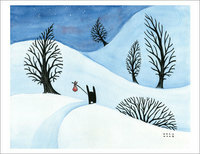 She currently works as a freelance illustrator. Chris Appelhans is a concept artist in the entertainment industry whose work can be seen in such films as the Oscar-nominated Monster House. He has recently published a collection of comics called Frank and Frank and is working as a freelance illustrator for several major motion pictures. As editor of the immensely popular graphic novel anthology series, Flight, Kazu Kibuishi has also garnered accolades for his graphic novel Daisy Kutter: The Last Train. His most recently published work, Amulet, has been optioned by Warner Brothers to be made into a feature film. Robert Kondo is a concept artist at Pixar Animation, where he has worked on such films as Ratatouille. In 2005, along with several other Pixar artists, he launched an imprint called E-Ville Press Comics to market and publish comics by Pixar artists. 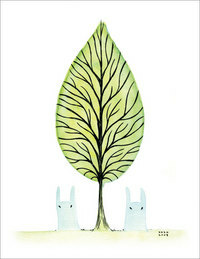 Yoko Tanaka has illustrated several children’s books, and has done editorial illustration work for publications such as the Los Angeles Times. Her work has been exhibitied in galleries throughout the U.S.